Qatar Petroleum and Shell, one of the largest petrochemical companies in the world, signed an agreement Tuesday to develop liquefied natural gas (LNG) bunkering facilities, the Qatari state-owned petroleum company said in a statement. The CEO of Qatar Petroleum Saad Sherida al-Kaabi and his Shell counterpart Ben van Beurden signed the agreement during an official ceremony in the Qatari capital Doha. "We view LNG bunkering as a promising opportunity for LNG to further grow as a clean energy source," Kaabi said, adding that the companies will evaluate suitable locations for the facilities across Europe, Asia and the Middle East. 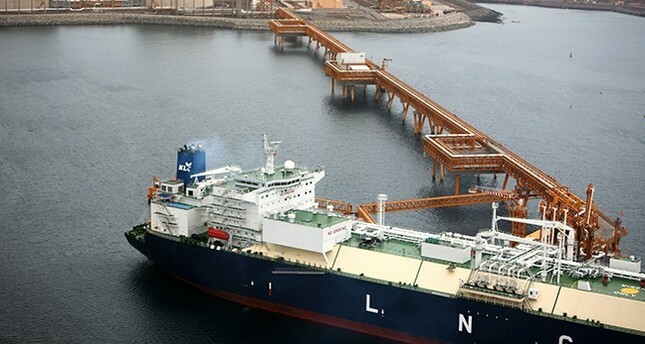 "LNG demand for bunkering is expected to increase significantly over the coming years and we believe there is real potential for such demand to reach up to 50 million tons per annum by 2030," Kaabi said. Shell is among the largest energy investors in Qatar's oil and gas sector with total investments of nearly $20 billion. Qatar exports natural gas to 27 countries, mainly the United Arab Emirates (UAE). Qatar covers 30 percent of the world supply of natural gas, and has the world's third-largest natural gas reserves, behind Russia and Iran. Starting from June 5, Bahrain, Comoros, Egypt, Maldives, Mauritania, Saudi Arabia, United Arab Emirates, Yemen's internationally backed government and one of Libya's three governments have cut off diplomatic ties with Qatar over accusations that the Gulf nation funds militant groups – charges Doha calls baseless. Several other Muslim nations also downgraded their diplomatic ties with Qatar.